This is a single player mission for Call of Duty. The Lost Symbol is a story based on the game RtCW. The pack contents custom textures,xmodels and good music from RtCW. After several asking to active people from the community there seems to be no objective string added even if all objective points are correctly put together. Design look directly ambitious with an intro cutscene that show you the butifull castle wolfenstrein like you never saw it before and so you are at the main gate the enter the nightmare and steal the magnificiant orb. Architecture is really outstanding with perfect squaling and interconnection, totally feetting textures form COD and RTCW and lot more content from RTCW included german speaking and original sound. 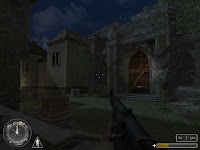 Attention was put everywhere to create a impressive conversion from one of the first WW2 FPS game. 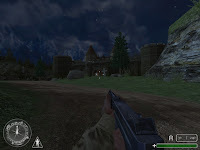 This release divided in two part is really a succession of great looking area from indoor to outdoor with a big amount of inteconnectivity that keep the player immersed in a one whole unit...the design has for me no evident flaws and really provide another expeirence according this great COD game. In conclusion : It has been a while since something different came for COD (I know it's already one year old), with it's particular atmosphere, great looking architecture and well balanced gameplay this beta release is really a must have without any hesitation part of my top 5 favorite maps .